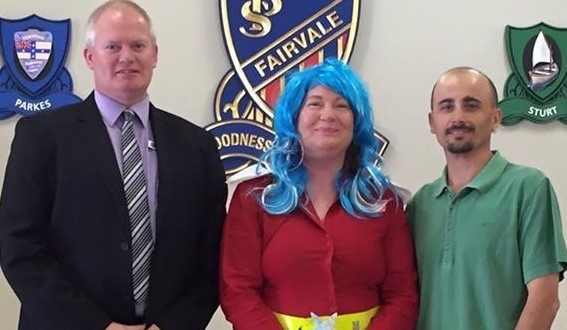 The Principal of Fairvale Public School invited me, Karen Tyrrell author and teacher for a unique school reunion. Principal, Anthony Pitt invited me to present my children’s resilience book Jo-Kin Battles the It to his school. 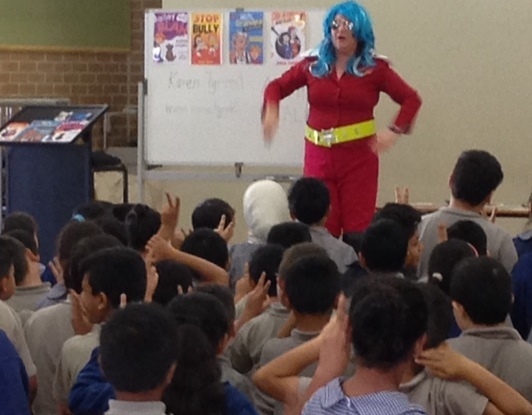 I presented an interactive author talk to two hundred students in the assembly hall. The kids and teachers treated me like a rock star with cheers, claps and a barrage of questions. To my surprise, I met teacher David Kinniburgh, another pupil who I taught in Year 2 several years ago. Joanne Brummell, another ex-pupil from Fairfield West came along to meet me. I met Romayne Penning, a girl I went to school with at Mt Pritchard East. 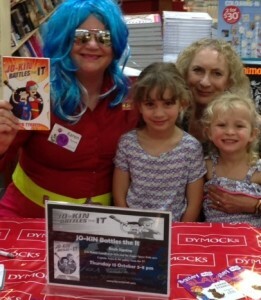 My husband’s school friend, John Lowe came along with his daughter to buy my books. Facebook fiend Susan Hili brought her children and grand children. The students were captivated by her presentation. She came dressed in character so right from the word go they were engaged. Karen encouraged audience participation and allowed for plenty of question time. Personally, it was a special moment for me because Karen Tyrrell was my Kindergarten teacher. I remember her warmth, nurturing and encouraging nature back then and meeting up with her all of these years later nothing has changed. Prepare your interactive talk with opportunities for the kids to interact and participate. Check your costume, props and posters are ready. Come wearing costume, wigs, hats etc and bring props. Speak in character. 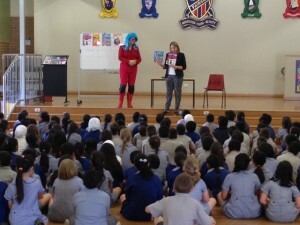 I wore my red Captain Astra uniform with shoulder pads, red gumboots, blue wig, yellow vinyl star belt and knee pads. 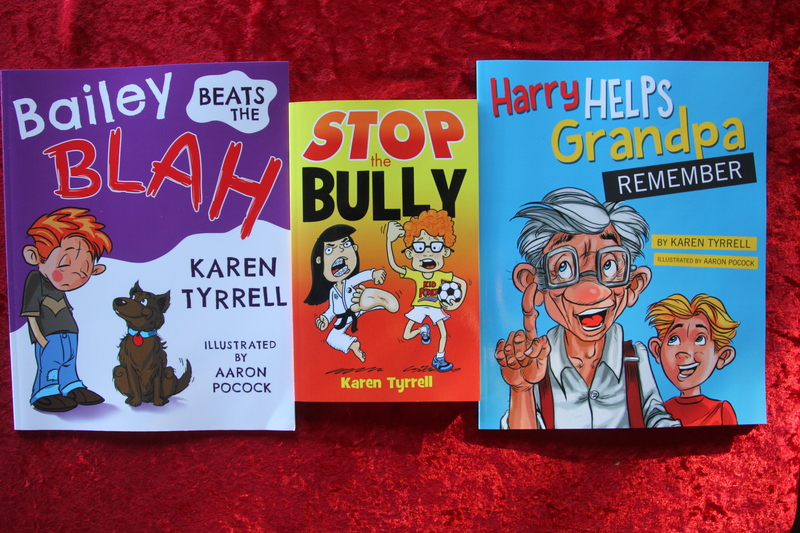 Introduce yourself and why you write in an inspiring kid-friendly way from the authors and characters point of view. Talk about each of your books in a FUN engaging way. Read sections from your books. Share tips on writing creative stories. Let the kids ask you questions about how you write and where you get your ideas. 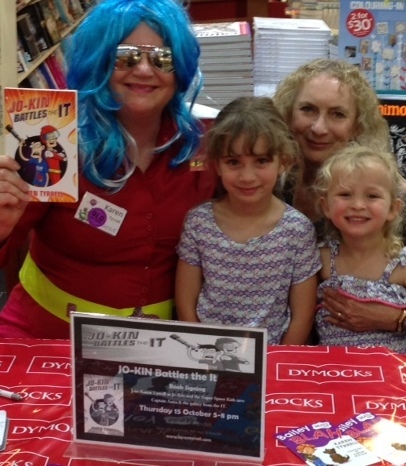 Ask the kids questions about your books in the form of a quiz. Give out prizes of bookmarks and postcards for correct answers. HOW amazing is… ‘My pupil is the principal’? What Tips were helpful to you? Can you please share, like, tweet, and google plus? That’s amazing, Karen. how wonderful!! Looks like a super-special visit, Karen. Awesome! There’s so many levels of amazing-ness to this story. 1. Firstly my ex-student remembered me and wanted to get in touch. 2. 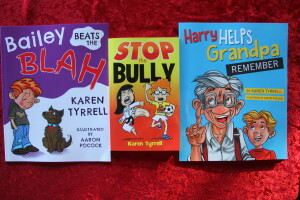 He’s a principal of a school and supports my resilience books. Thank you for visiting our school. We loved listening to your motivational talk about reading and writing stories. It was really exciting when we saw that you put pictures of our school on your website. 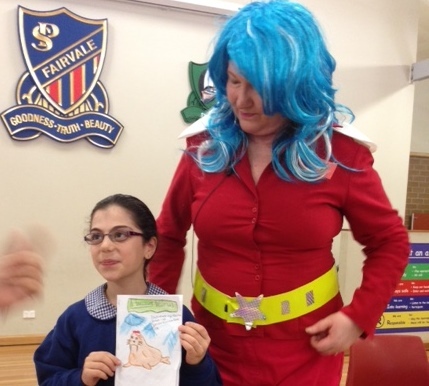 It was super exciting when we saw our classmate, RANITA, being recognised for her story about you. Thanks for your lovely words. Thrilled you liked the photos of my visit and of Ranita.